The article is devoted to develop dynamic multifactor model of the functioning of industrial organizational structures. The model allows to evaluate and predict the effectiveness of ongoing organizational and technical measures. Evaluation is made on the analysis of the current state of organizational and technical level of production system, the level of real wages, constructive-technological complexity of manufactured products (services). Accounting for such endogenous indicators allows us to consider the organizational structure as a closed single unstructured whole, characterized by organizational and technical level, which produces a single universal product, measured in units of constructive-technological complexity, and the result of which is the level of real salaries of workers. The basis of the model laid a dynamic model of the economy with discrete time Solow, industrial-motivational concept G. Samarin, synergistic benchmarking - the practical application of scientific school "Economic Synergetics" B. Kuznetsova, the theory of constructive-technological complexity - the practical application of scientific direction "Theory of efficiency and improvement of integrated industrial production," the head of B. Yakimovich. The text of your abstract should be placed here. It is in your own interest to ensure the abstract adequately describes the content of your paper. After the Second World War in the U.S. have been 12 and 6 of the financial and economic crises. Total direct losses only to the U.S. economy, according to the group of scientists, G. Samarin, S. Doroshko, V. Chekirdy , amounted to $ 60 trillion dollars. And in view of lost profits - more than 100 trillion dollars. And this is only the United States. Given the loss of all developed countries, now humanity would long to solve the problems of poverty, environment and noosphere development. Currently, all the leaders of developed countries have recognized that the existing economic models and theories do not allow them to effectively manage the economy. Practice shows that most economic theories can only give rise to crises. An even more severe difficulties survive micro economy. C formidable challenges in planning its activities in the context of globalization, hypercompetition, the dominance of knowledge economy and the rule of innovative technologies facing most organizational structures (businesses, factories, enterprises, firms, etc.). Failure to capture the complexity of the problems, understand relationships and interactions, this is the main drawback of most managers. This also explains the actions of many large organizations and power structures that resemble the "blind flight". As a possible alternative paradigmal management organizational structures at the present time scientists STU Izhevsk (Votkinsk Branch) developed an integrated model for assessing and predicting the effectiveness of planned organizational and technical measures conducted within the organizational structure. The system aims to become one of the main tools to support decision making in the planning of organizational and technical measures to improve the functioning and competitiveness of organizations. As the base of the model used in the dynamic model of economy with discrete time American economist Nobel laureate Robert Solow. 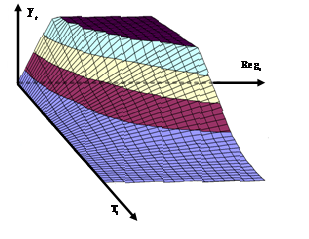 Solow model describes the economy as a nonlinear dynamic system and is used to study transient processes in the economy associated with the replacement of one variant of macroeconomic policy to others. C — Constructive-technological complexity of products, represents an inherent property of it, taking into account the geometric, structural and substantnye properties of the product and its structural components, as well as placed upon them design and technological requirements in accordance with the existing level of development of productive forces. 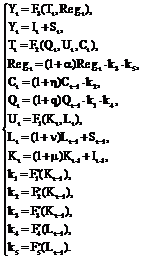 k1, k2, k3, k4, k5 — Coefficients considering the latent connection. The basic idea of building an integrated model of motivation is the experience of Mr. Ford. H. Ford, as head of a company and not a professional economist, first in practice, found that pay is a major, major factor, in contrast to capital, technology, investment in determining economic growth, Gross domestic product, businesses of all sectors of the economy through their direct and latent communication and the entire socio-economic system . Therefore, the presented model, attention is paid to the level true salaries S as a key competitive genesis . Calculation of the index of organizational and technical level of the organizational structure U, complexity of manufacturing products in the organizational structure T and constructive-technological complexity of products C will be made on the basis of developed by scientists STU Izhevsk (Votkinsk Branch) methods [4,5,6]. Calculation of regional features Reg will be calculated based on the methodology proposed by G. Samarin, in developed by the industrial-motivational model . Indicators characterizing the quality of the project (design excellence), determined in accordance with the methodology of synergistic benchmarking, the practical application of scientific school "Economic Synergetics" B. Kuznetsov . 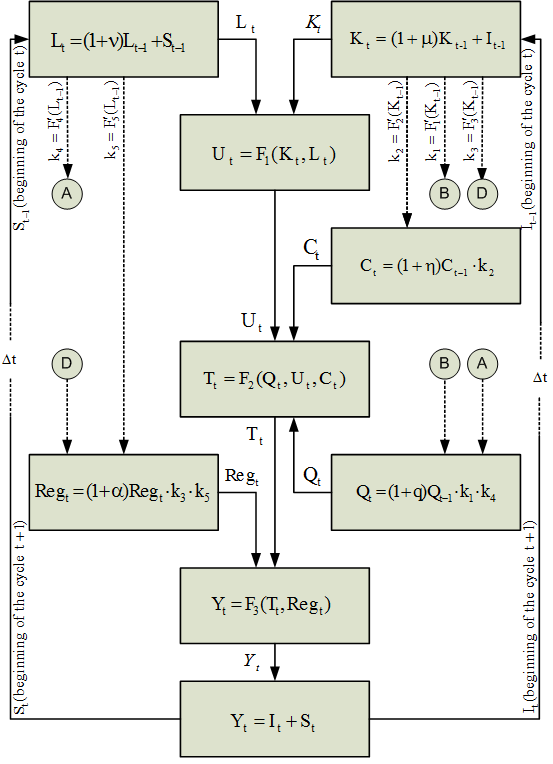 The block diagram of a mathematical model for controlling the efficiency of organizational structures is shown in fig. 1. Figure 1. Block diagram of the mathematical model for controlling the efficiency of organizational structures. Fig. 2 shows a graphical interpretation of the mathematical model for controlling the efficiency of organizational structures. Designed on the basis of the mathematical model of an integrated system of performance management organizational structure will enable scientifically approach to strategic planning of organizational and technical measures aimed at ensuring the competitiveness of both the organization and the region as a whole. 1. Samarin, G.P., Doroshko S.E., Chekirda V.A. “Noospheric economy: back to basics. Basic value of work and motivation”. SPb. : PIF.com, 2008; pp. 338. 2. Henry Ford “My life, my accomplishments”. Ekaterinburg: Ural. JUDr. Publishing House: Vetrastar, 2003. 3. Fominykh R.L. “Methods of increasing the level of real salaries based on the theory of constructive-technological complexity and technological hype” In: Proc. of the Eighth International Scientific and Practical Conference “Research, development and application of high technologies in the industry” High-tech, basic research, education and industry, Spb. : Izd Polytechnic. Ca-ta, St. Petersburg, Russia, 2009, pp. 41-42. 4. Korshunov A.I., Fominykh R.L. “Using indicators of organizational and technical level of production system to assess the complexity of manufacturing production range” Intelligent systems in manufacturing: Periodic scientific-practical magazine, IzhSTU, Izhevsk, Russia, 2007, Vol. 1. pp. 128-138. 5. Fominykh R.L. “Development of an automated subsystems of constructive-technological complexity, complexity of manufacturing of parts and the organizational and technical level multinomenclature production” Thesis for the degree of candidate of technical sciences. IzhSTU, Izhevsk, Russia, 2003, pp. 134. 6. Korshunov A.I. “Creation of automated control systems of machinery production, based on the theory of constructive-technological complexity” Thesis for the degree of Doctor of Technical Sciences. IzhSTU, Izhevsk, Russia, 2008, pp. 313. 7. Galenko V.P., Samarin G.P., Strakhov O.A “Business planning in an open economy” A manual for university students, Publishing Center "Academy" Moskau, Россия, 2005. 8. Kuznetsov, B.L., Sharamko M.M. “Synergetic benchmarking” INEC, Neb. Chelny, Russia, 2006, pр. 187. Roman Fominykh, PhD Assoc. Prof.